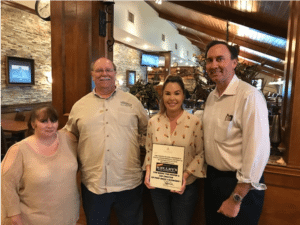 Congressman Pete Olson took time out of his very busy schedule to come thank Kelley’s Country Cookin’ for being such a great Economic Driver and Job Creator for Fort Bend County. This is their 7th Anniversary in Meadows Place and having eaten at Kelley’s several times , the Congressman is appreciative of both the food and the family atmosphere. 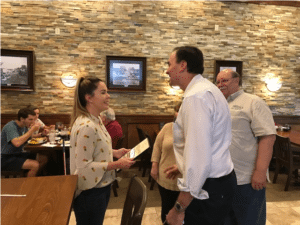 As he and Jessica Kelley talked, Congressman Olson pointed out that one of wonderful results of Kelley’s is that families come here to eat together, and when families eat together they grow closer and stronger and that also makes the country stronger. She was pleased, and surprised that he would take the time to talk with here about such things. Congratulations to Kelly’s Country Cookin’ and the Kelley family.